The Toronto Maple Leafs will officially retire the #13 jersey worn by Mats during his thirteen year tenure in Toronto. The Swede who captained the team for ten years also led the Leafs into the playoffs ten times. It was on June 17th, 1987 when the Quebec Nordiques called Mats Sundin’s name as the 1st overall selection in the 1987 NHL Entry Draft, that is where it all began. He had four great seasons in the Nordiques organization. His third season, 1992-93, in Quebec was his greatest in which the Swedish centerman had scored 47 goals and had an incredible 114 points while leading the likes of Joe Sakic, Mike Ricci, Owen Nolan, Martin Rucinsky and the rest of the Nordiques to a 47-27-10 record. The record of 47-27-10 was and is remaining as a Quebec franchise record. In the offseason prior to the 1994-95 season as the Quebec franchise was in financial trouble, Mats Sundin was traded to Toronto. He was traded to Toronto along with Todd Warriner and Garth Butcher in exchange for Sylvain Lefebvre, Landon Wilson and a former Leafs captain, Wendel Clark. Moving Wendel Clark was a huge deal to the Leafs organization because he was a franchise player. Since he was moved for Mats Sundin, that load would be passed onto his shoulders to be a franchise player for years to come for the Toronto Maple Leafs. Mats Sundin responded great to the new environment collecting 47 points in 47 games, in the shortened season because of the 1994-95 NHL lockout. Mats tallied 83 points the next season. In the 1996-97 season in which Mats Sundin put up his best point total as a Leaf with 94 points, 41 of them being goals, Doug Gilmour was traded to the New Jersey Devils. As Gilmour was captain, Sundin became Gilmours successor was appointed captain of one of the best hockey markets in the NHL. He became the first European to dawn the “C” in the Leafs organization. Mats recorded 74 points in 1997-98. With the Leafs acquiring Curtis Joseph, otherwise known as “CUJO” and Steve Thomas in the offseason before the 1998-99 the Leafs team was looking great going into the season. Mats, Thomas and CUJO led the Leafs to the conference finals in playoffs. It was the first time since the 1992-93 season that the Leafs had made the conference finals and that was before the Leafs acquired Sundin. The Leafs ended up losing to the Buffalo Sabres in five games but it was a great season for Sundin and the Leafs. Mats lead the Leafs in scoring in the playoffs with 16 points in 17 games. For the next two years the Toronto Maple Leafs made the playoffs but both times lost in the second round. Sundin was continuing to put up great numbers with 73, 74 points respectively in those two seasons. In 2001-2002, Sundin again led the Leafs to the conference finals. Again they could not get into the Stanley Cup finals as they lost in six games to the Carolina. That was the farthest playoff run the Leafs had made since they won the cup in 1966-67. He put up great numbers from the 2002-03 season to the 2005-06 season, except for the lockout that cancelled the NHL season in 2004-05. During the lockout where most NHL players went to Europe, Mats decided his body needed a rest and took the season off. He returned with a great season in 2006-07. In that season he became the 34th player to score 500 career NHL goals. It was a game to remember for sure! It was on October 14th, 2006 against Miikka Kiprusoff and the Calgary Flames. The game went into overtime as it was 4-4 after regulation. Two of the Maple Leaf goals were scored by Mats (career number 498 and 499). 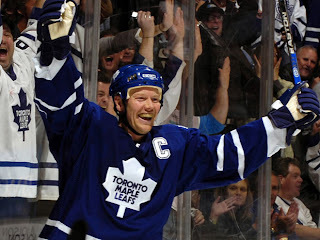 In overtime Mats Sundin recorded his 500th goal in great fashion with a great overtime winning goal to complete the hat trick and reach the 500 goal plateau! What a game for Sundin! Mats left the Leafs in the offseason after the 2007-08 season. On December 18th, Sundin signed a contract with the Vancouver Canucks, where he hoped he would have a chance to win a Stanley Cup. Mats did not end up winning the Stanley Cup that season. He retired from the NHL on September 30th, 2009. Mats set many club records with the Leafs, and ended up with 564 goals and 785 assists in 1346 NHL games. Mats was a beloved player by Leafs fans and continues to remain in the hearts of Maple Leafs fans, and is known as one of the greatest Maple Leafs players of all time. Everyone will get to witness the retirement of his number 13 jersey tonight against the franchise rival the Montreal Canadians.